OXFORD, Miss. 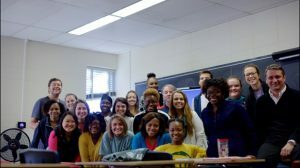 – With a significant climb in national rankings and the hiring of tenure-track faculty, the Department of Social Work at the University of Mississippi is experiencing unprecedented growth. Dr. Jandel Crutchfield presents her social work research. U.S. News and World Report ranked the department’s master’s program No. 103 out of 200 nationally, which is a 45-spot climb since 2013. In addition, seven new professors have joined the department, each bringing years of expertise in the field. Formerly interim director of social work at Louisiana State University, Cain accepted the position here in 2014. 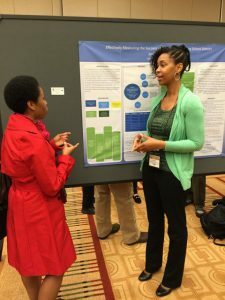 A graduate of the University of Tennessee, her research interests include disaster mental health and parenting interventions with high-risk and vulnerable families. The latest rankings demonstrate the department’s effort to become one of the best places to earn an MSW, said Velmer Burton, dean of UM’s School of Applied Sciences and professor of social work. Other new social work faculty are Javier Boyas, Viktor Burlaka, Jandel Crutchfield, Yi-Jin Kim, Tess Lefmann and Younghee Lim. Institutions they earned doctorates from include Boston College, the University of Michigan, LSU, the University of Texas at Arlington and the University of Tennessee. Each has had peer-reviewed articles published in various professional journals. Viktor Burlaka shares a moment with his social work students. Established in 1974, the Department of Social Work’s mission is to enhance human well-being and help meet the basic needs of all people – with particular attention to the needs of those who are vulnerable, oppressed and living in poverty. For more information, visit https://sw.olemiss.edu/.